On the back of my own lecture in January sea serpent researcher, Charles Paxton, will be giving a talk about the Loch Ness Monster on April the 9th, 2013 at the Scottish Fisheries Museum in the harbour town of Anstruther, near St.Andrews in Fife, Scotland. The talk will explore what science says about the biology of the loch, about what people see and the probability of an unknown species in the loch. I would point out that an archive of Rip's older newsletters can be found here. This is half complete, but I have now scanned the remaining newsletters and uploaded them to Google Drive. All that remains is to add these as links to the aforementioned archive link. Rip's newsletter will enter its 39th year next month and has been a valuable source of information and analysis throughout those years. Here's to another year! Whilst looking through some archives, I came across some items of interest on a creature reported in the Beauly Firth. This stretch of coastal water outside Inverness is about six miles long by two miles wide and has some significance to our interest in Loch Ness as the mouth of the River Ness meets the Beauly Firth at its exit into the Moray Firth (see map below). The first report was found in a couple of far flung newspapers and the clipping below is taken from the Schenectady Gazette of the 1st March, 1955 (a newspaper from Schenectady county in New York state). The next account is sixteen years later and is taken from the Inverness Courier for the 30th July 1971. 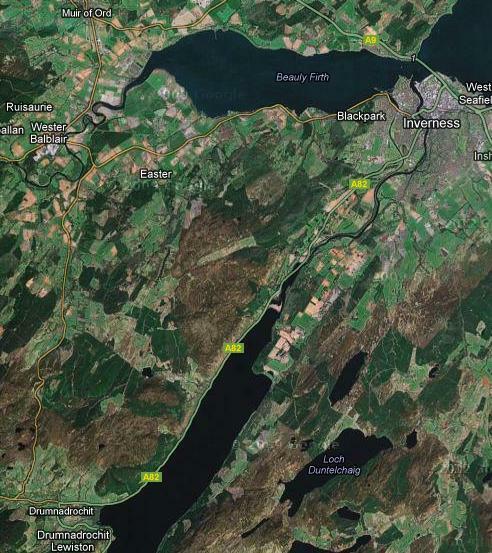 "Was there a monster in the Beauly Firth on Monday afternoon? Twenty boys of the Newcastle Cathedral Choir, who returned home yesterday after spending a nine day holiday in Inverness are convinced that they saw such an object some miles west of Inverness in the Beauly Firth. The boys were returning to Inverness by train on Monday afternoon after a day outing to Skye, when one of the party, Peter Harrison, noticed a trail of foam in the middle of the Firth. He shouted to his pals, and the three leaders of the party - Mr. G. East, Mr. R.? and Mr. G. Bolton - to look out of the window of the train. After two minutes there was a splash and a large, black slimy object appeared. It moved eastwards for 40 seconds, at a speed of 25 miles per hour before producing another splash, again creating a trail of foam. The boys, who said the object had one hump and was too large and too fast to be a porpoise, managed to obtain a clear sighting of the object, and each was able to draw a sketch of what they saw. 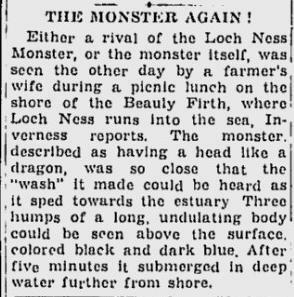 Only last week, a family from Cupar, Fife, walking along the shore at the Longman, claimed they saw a 'monster' in the Beauly Firth." "Porpoises are frequently seen in the Beauly and Moray Firths, swimming in schools, while seals are occasional visitors, and there have even been bottle-nosed whales. There may therefore be a simple natural explanation of these sightings, especially as the foam disturbance may have been caused by porpoises in battle with salmon or other fish which can be an awe inspring sight." The famous Nessie witness Alex Campbell was a correspondent for the Courier at this time, but it is not known if he was the author of this report. What are we to make of these reports? Apart from simplistic explanations about porpoises which are regularly seen in those parts and are easily recognised by their dorsal fin, could this alleged beast possibly be our own Loch Ness Monster out of its regular "chez mois"? Now reports of strange creatures have been reported from adjoining Loch Dochfour, the River Ness and now the Beauly Firth. No doubt more could be dug up with further investigation. But should we seriously say that these were not the Loch Ness Monster but the Loch Dochfour Monster, the River Ness Monster and the Beauly Firth Monster? Probably not. That the monster could get to these parts is not impossible and has been discussed since the days of Rupert T. Gould in 1934. His motivation for this topic was obvious enough having authored the book "The Case for the Sea Serpent" not long before in 1930. Gould believed the Loch Ness Monster could be a stray sea serpent and hence an access route from the sea which did not prove too difficult was uppermost in his mind as he traced the route from Loch Ness to the Moray Firth in his book "The Loch Ness Monster and Others". A passage up and through the River Ness looked the most obvious while the other journey through the Caledonian Canal looked rather more daunting to a sea serpent considering the number of locks that have to be negotiated.